Golflands local Tiffany Pillay received 2nd Runner Up in the recent Miss Auckland competition. Photo supplied. Placing highly in the recent Miss Auckland contest was a “dream come true” for Tiffany Pillay. The Golflands local, who has lived within the Howick and Botany area for 20 years, placed 2nd Runner Up in the competition, which saw Emma Gribble crowned overall winner. Pillay entered the competition after stumbling across an application on Facebook shortly after completing her Bachelor of Laws. “I thought ‘wow, here is an opportunity to use a potential platform to make a difference, what a wonderful opportunity to give back to my community. The same community that has allowed me to grow to be the person that I am today,’” she said. 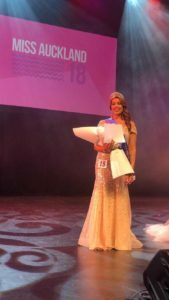 The former Pakuranga College student raised $3400 for Miss Auckland’s chosen charity of Youthline during the competition through events such as bake sales, sausage sizzles, a high tea and charity quiz night and called it all “an amazing experience”. The recent graduate is currently searching for her first job as a qualified lawyer – a dream she’s had since she was eight years old. I am surprised these competitions still exist in today’s society. why? they don’t even have to send in a pic to get an Interview and they were then definitely not chosen on looks alone. They go out and work themselves to the bone fundraising and It builds their confidence and gives them opportunities that they wouldn’t have gotten otherwise. The winner was chosen by how much they put into the Pageant. Not due just to their looks. These girls all came in different shapes and sizes and were all very very different looking.They also raised $41 thousand for Youthline.